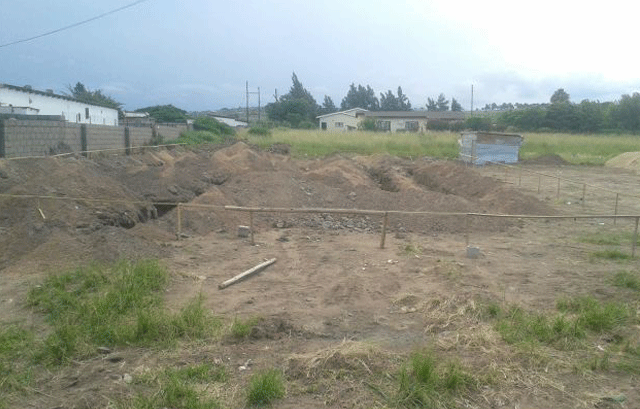 THE questionable sale and transfer of ownership of a property belonging to royal orphans in a Manzini township owned by the late Evelinah Dlamini has sparked new interest as the new owner recently began construction on the property. They interested persons said they were under the impression that the matter was still under review as per the request of Manzini Regional Administrator Prince Gcokoma. A family member, Vincent Dlamini who brought this matter to the public’s attention, said the late widow at the time of her demise was living on the property with her grandchildren. Following her death, one of her grandchildren, Fani Mazibuko together with Masundvini Royal Kraal Indvuna wrote a letter stipulating that only Mazibuko and his sister Norah Mazibuko were the surviving grandchildren of Dlamini. At the time of Evelinah’s passing, Mazibuko and his sister Norah had moved to their parental home at Maliyaduma. However, a source said, when the matter was further investigated it was discovered that there were other grandchildren who lived on the property with their grandmother before she died. When the matter was brought to the Master of High Court in Manzini, it was demanded that further investigations be conducted to identify all the beneficiaries. In a letter written by Vincent Nathi Dlamini addressed to Regional Administrator, Evelinah had five children, four of them were boys and one girl. However they are all deceased but survived by 13 children. He stated that in 2015 they were contacted by an officer from the Master of the High Court in an attempt to verify the claim made by Fani Mazibuko that the only surviving grandchildren were him and his sister. He further stated that they went to the master’s office accompanied by Regional Administrator Prince Gcokoma together with Khopha Dlamini who is Evelinah’s brother in-law. Vincent further stated that Prince Gcokoma notified the Master’s Office that the allegations made by Fani Mazibuko were incorrect. He also notified them that Mazibuko had no right to sell the property, only their grandfather Khopha Dlamini could represent the grandchildren in the sale of the property. An officer in the Master’s office advised them to write a letter notifying the office that there were disputes in the sale of the property, which they did and it was placed in their file. Dlamini alleged that Prince Gcokoma also notified the buyer of the malpractice in the sale of the property done by Mazibuko. The buyer is said to have acknowledged it and requested them to consider selling him the property once the matter was resolved. However it is alleged that on the 4th of December 2016, the buyer erected a notice on the property for an application for rezoning the property from residential to commercial. Not long after the notice was erected, Fani Mazibuko came and plucked the roofing material, windows and doors as well as the frames and chucked out all the occupants, Evelinah’s other grandchildren. One of the grandchildren who is said to have been bedridden died supposedly due to hypothermia, alleged Dlamini. Dlamini also said the buyer offered the grandchildren who were forcefully evicted from the property E200 each and told them that they should go and look for an alternative place to rent. He is alleged to have promised to rent a guest house for them. Dlamini further said the grandchildren were now scattered all over the country, homeless, as their rightful home was illegally taken from them. They pleaded that the law should come to their aid, added Dlamini. Following the recent construction underway in the property, Dlamini said they approached the Attorney General’s office to enquire about the sale of the property as well as the Master of the High Court offices in Manzini where the complaint was first reported. He said they were told that according to the documents there was no malpractice in the sale of the property. This was a surprise to them, said Dlamini, because the same office had told them that the matter would be investigated and they should rest assured that the office would get to the bottom of it. Secondly Dlamini said when he went to the AG’s office in Manzini; he was given a document for the Liquidation and Distribution Account. The document dated January 7, 2015, read the first and final liquidation and distribution account in the estate of the late Evelinah Dlamini nee Tsabedze who died on the 15/11/2014 file number EM 33/2015. Among the assets list there is one immovable property in the district of Manzini, which was valued at E285 000. In the list of liabilities, there are claims against the estate which include E34 764.19 which was paid to the Manzini Municipal Council for the rates owed by the property. Also there was a deduction of E3 562.50 which was the executor’s remuneration who is the accused Fani Mazibuko as well as E2 284.62 for the bond refund also paid to Mazibuko. After all the deductions were made, the balance was E243 656.44 which when deducted equally among the twelve surviving grandchildren each would have received an amount in the region of E20 000. The document also states that the immovable property, shall be sold and the proceeds shared among all the grandchildren of the deceased in equal shares. The document also consists of a list of all the 13 grandchildren who were to benefit from the sale of the property. The complete list of the beneficiaries is Bhekie Mazibuko, Norah Mazibuko, Fani Mazibuko, Tengetile Dlamini, Senzo Dlamini, Mcolisi Dlamini, Msimisi Dlamini, Sakhile Dlamini, Mthuthu Dlamini, Siphephiso Dlamini, Takhona Dlamini, Buyisile Dlamini and Mzwandile Dlamini. However of note is that two of the grandchildren have passed since the death of Evelinah in 2014 and they are Senzo Dlamini and Buyisile Dlamini, the other grandchildren are still alive. When contacted by this publication, one of the grandchildren by the name of Mthuthu Dlamini said, ever since they were kicked out of their home, they had been scattered all over the country. Also they were under the impression that the matter was still under investigation and surprising to them that the Master’s office was saying all was in order when they promised them that the matter would be resolved. Dlamini also said in the sale of the property, only the executor Fani and his sister Norah Mazibuko benefitted from the sale of their home. Dlamini added that he would like the world to know that people in power get away with rot since it looked certain that a deal was struck between officials in the Manzini Master’s office with Mazibuko and the buyer. He said it was hurtful how their home was taken under their nose and they were left helpless. The buyer on the other hand said, according to his knowledge there was no malpractice in the purchase of the property. He purchased the plot through his lawyer who handled all the paperwork. He also said that the complainant Vincent Dlamini was not even a relative to the late Evelinah; he is just an agitator who wants to tarnish his good name. The buyer said according to him and his lawyer, all the beneficiaries received their share. He followed the right procedure in the attainment of the property. He even contributed in the burial of one of the deceased grandchildren, Senzo Dlamini. When this publication contacted the executor, who is also one of the grandchildren Fani Mazibuko, who is currently employed by the buyer, he said his late grandmother left him in charge of the property’s documents. When the Masunvwini Royal Kraal Indvuna wrote the above mentioned letter, he had discussed with the rest of his siblings that in order for the sale and transfer to be faster, they would say that only two grandchildren were still alive. He alleged that later when they realised that it could backfire, they decided to include all the beneficiaries in the list. Mazibuko also said that all the beneficiaries received their share, only one Mthuthu Dlamini refused to get his share since he was against the sale of the property. He alleged that Mthuthu Dlamini contacted Vincent Dlamini to lodge an opposition to the sale of the property. He also said the other grandchildren claimed their share and relocated to South Africa. When asked for their contacts he said he should be contacted today.